Following the recent Chanel 4 programme, Leaving Neverland, in which two men gave their testimonies about alleged sexual abuse by Michael Jackson when they were boys, a group has sprung up to defend his reputation under the hashtag #MJInnocent. The group argue that Jackson's reputation is being traduced by the media and that as he's dead, he cannot defend himself. The group also make some tendentious assertions that the two men at the centre of the case are motivated by money. 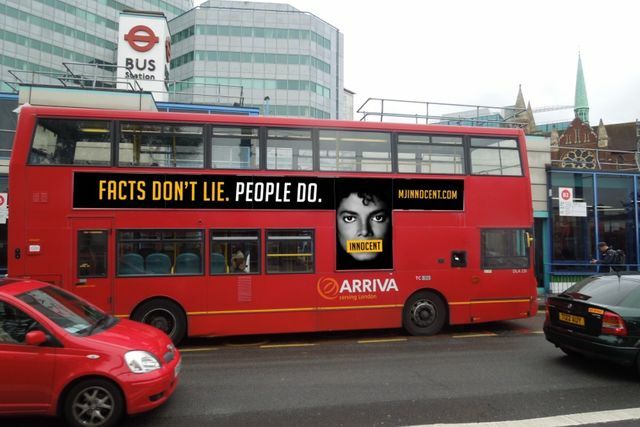 The group launched a crowdfunding campaign and raised enough money to launch an out-of-home campaign on London buses and bus shelters with a picture of Jackson with the word "innocent" positioned over his mouth and the line "Facts don't lie. People do." Elements of this story are reminiscent of similar stories from recent years. For example, the reputations of Edward Heath, Leon Brittan and Greville Janner were subject to allegations of serious sexual misconduct after their deaths based on what now appear to be unsafe accusations by individuals with financial motives. However, the poster campaign has provoked a serious backlash, with campaigners particularly concerned by the assertion that Jackson's accusers are lying. The Survivors Trust has said that the message of the campaign could discourage victims of sexual assault from coming forward. Its one thing to argue that Jackson is should be presumed to be innocent until proven guilty, but quite another to argue that his accusers must be guilty of lying. Given the conservative approach that TfL has recently adopted in connection with certain types of advertising, such as HFSS foods, it is surprising that they initially accepted the advertising. Now, however, TfL has decided that the ads must be removed, saying "We have reviewed our position and will be removing these advertisements. They have been rejected due to the public sensitivity and concern around their content." Allegations like those against Jackson raise complicated, conflicting concerns: the presumption of innocent on one hand and the need to treat seriously the victims of sexual misconduct by powerful men on the other. One thing is clear: billboard advertising is not the right media in which to advance these arguments or resolve these difficult and sensitive issues. "They have been rejected due to the public sensitivity and concern around their content."